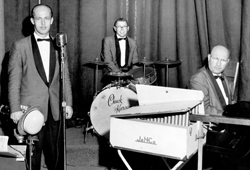 Portland native Charles (Chuck) Karsun z"l was best known in life as a musician and entertainer with the Chuck Karsun Orchestra. Upon his passing in June 2007 however, Chuck became among the greatest examples of generosity in OJCF's history. Through his will, Chuck bequeathed one of the largest endowment gifts ever to Portland's Jewish community, over $3.1 million, and established the Chuck Karsun Memorial Fund of the Oregon Jewish Community Foundation. The fund continues to generate annual distributions from the growth of the invested principal. Recipients include Jewish Family & Child Service, Jewish Federation of Great Portland, Jewish National Fund, OJCF, Portland Jewish Academy and Congregation Shaarie Torah. These funds will support our community and significantly increase the impact of the OJCF Community Endowment Fund. The son of loving parents who instilled in him a love for tzedakah, Chuck was deeply involved in the Jewish community. His longtime friend and attorney, Marv Nepom z"l once shared, "Chuck knew exactly what he wanted to do with his estate and he wanted to make sure that his support would continue in perpetuity. He loved his Jewish community, performing for audiences with his orchestra, and giving back to others through support of the Jewish Senior Citizens Club, and his volunteer work at the Robison Jewish Home." Chuck was a member of both Shaarie Torah and the Eastside Jewish Community of Portland, where he was awarded lifetime membership. The Sisterhood of the Robison Jewish Home also awarded Karsun Life Membership and the Jewish Senior Citizens Club dedicated a star in his honor at Rose Schnitzer Manor. He was a good friend of the late Arthur Krischevsky, who also left a generous endowment gift to OJCF that now provides scholarships for Oregon students seeking Jewish learning in the United States and abroad. For those who knew him, Chuck's generosity to the community was not unexpected, but the magnitude of his gift was a wonderful surprise. He is a great inspiration for those who are able to follow his example: to strengthen our community and its ability to meet the needs of our people in perpetuity.